The sight of a hospital bed in a living room is as emotionally troubling to me today as when I first saw such a scene many years ago – it jolts me to the core. I mean, I’m as animated and as enthusiastic as ever when I enter one’s home, but it’s impossible to see the hospital bed in the living room and not be emotionally impacted by how unjustly out of place it is. The normality that surrounds the hospital bed often makes it even tougher to bear – couches, a flat-screen TV, children playing, maybe a tail-wagging dog – a home in every sense. But, then, in the middle of the living room is a hospital bed, an unavoidable symbol of all of the emotional, mental, and physical pain that’s been endured, is being endured, and will be endured. And, it’s all touchable – heart-wrenching touchable – right there in the middle of the living room, a hospital bed. 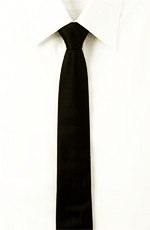 I awoke that Sunday morning with one thing on my mind: I needed to add a black skinny tie to my wardrobe. While I have to dress business casual at work, and wear suits for public occasions, I’ve taken to a refined, retro look in my personal life. Certain ensembles simply never go out of style. And, trousers, a crisp white button-up shirt, and a black skinny tie take masculinity to an all-time classic note. As long as you’ve got a thin build and a tailored fit to your garments, you just can’t go wrong with the look – it’s timeless elegance on the town. But, I didn’t own a black skinny tie, and wanted one for the coming week’s dinner out. So, I didn’t know if I should I go to the mall or shop online – where could I find a 2” -wide black skinny tie on a Sunday morning? But, then my colleague sent me a text message, saying that he was running a little behind schedule. We had to deliver and fit a new wheelchair around noon that Sunday, and I suspected that it might be an emotionally tough situation. Maybe that was my fixation on the black skinny tie that morning, to keep my mind off of our appointment later that day. The back story that I knew for our appointment was of a car wreck where the best friend died, and the twenty-something young man was paralyzed. No matter how professional you are, you’re still a person, and to deliver a wheelchair under such circumstances can be harrowing, no matter how many times you’ve done it. Yes, you’re helping someone with the gift of mobility, but you’re also seeing our humanity in its most vulnerable state – and it’s impossible not to feel helpless, as well, wishing you could do more than merely provide a wheelchair. When we arrived at the young man’s house, it wasn’t fully-accessible yet, so my colleague and the young man’s father had to help get my own power wheelchair up a step. And, then, as I entered the house, there was the hospital bed – in the front room. As I rolled past the hospital bed, I encountered the young man using the wheelchair given to him right out of in-patient rehab. I introduced myself, shook his hand, and was struck by his eyes, the clarity in them. I met the mother and father, and all seemed pleased to see my colleague and me. In such situations, a new wheelchair can be seen as both a blessing and a curse by families. On the one hand, a new, custom wheelchair makes life easier and more comfortable because it’s usually a big leap in technology from what’s given to those right out of rehab. Yet, on the other hand, a permanent wheelchair can reflect just that – permanency – so it’s typically an occasion of rightfully mixed emotions. Nevertheless, the family was glad to see us, and enthusiastic about the new wheelchair, and after it was properly fitted and all of the workings were explained, we just kind of sat in an informal circle in their small family room and talked. As I learned, prior to the accident, the young man had left college and was working at a restaurant. But, just a few months after the accident, right out of rehab, he was already involved with Vocational Rehabilitation, working on getting enrolled back in college. And, as we talked, it was as if he had a check list titled, “Exactly the Right Moves to Make,” and was nailing every item. Yet, while every individual, family, and situation is different, I have witnessed that it’s common for family members to initially have far more of an emotional realization than the injured individual, namely because the injured individual is in all-out survival mode, whereas the family is absorbing it in an emotional and mental way. And, with this particular family, I perceived that while the son was learning to live with the physicality of his paralysis, the parents hinted at struggling with the emotions of it all – you could just see it in the tiredness of their eyes. As we sat talking, the mother in a wing-back chair beside me, I shared with them that they were on a journey, one that was shared, yet would be experienced by each individual in different ways, at different times. And, in this process, over months and years, they’ll have good days and bad, that no mountain ascent is a steady pace, that like a magician pulling countless scarves from a hat, just when they think they’re out of inner-strength, they’ll find more – we all do. And, then everyone just cried. But, in the air wasn’t despair; rather, for a moment, it was as if someone opened all of the windows, allowing a cleansing breeze to flow in, and there was relief – just tears of relief. I have a skinny black tie. I remember the first time the therapists arrived at our condo with a few wheelchairs – I was horrified and didn’t want “all the neighbours” seeing. Thank you for your sensitivity – I explained to the therapists how I felt about the display, and they said they never thought about it because they do this all the time. Wheelchairs don’t have special meanings to them. Thanks Mark for the insight and the visuals surrounding the huge-ness of the first stages of disability and as all things new they one day pass away into “oh yeah, been there done that, mov’n on.” It is a shared experience and you articulated that so very well, thank you. What a beautifully written account of a remarkable encounter. I have no doubt that your presence there and your words of wisdom helped every member of that family immeasurably. Thank you so much for sharing this! Beautifully written – emotionally open and honest yet positive and thoughtful. And you brought your concept full circle, the black skinny tie. I will never look at my own “black skinny tie” in the same way again! Thanks.